The main structure for working together when we meet is the talking-stick circle. The simple guidelines given below maintain a flow of energy and mindfulness, endowing equal status to all participants and allowing the management of feelings and opinions. All of these are vital for a fruitful co-creative process. Circle-working is a powerful tool for creativity, problem-solving and conflict resolution. The process involves a profound listening and understanding of others and the essence of a situation. It is a ‘living meditation’ which ultimately begins to have magical impacts, as our understanding of how things work broadens and deepens. It involves stretching beyond our own personal viewpoints and positions. 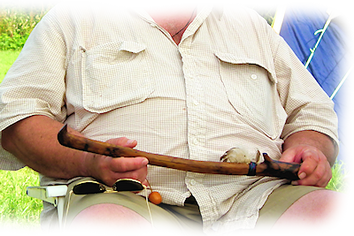 The process continues until the stick has gone round the circle once or several times, or until the process is agreed to be complete by everyone present. In our meetings, meditation and use of the talking stick are generally followed by further focused psycho-imaginal practices working with the themes and issues that arise. These are devised by the group in the flow of the process and with insights that arise within the altered space of the moment. At such times we are connected with our higher selves, the overlighting spirit of the group and with our 'inner helpers'. More details about these are given in The Book of Possibilities, a book written by the group as a whole.